Cloud computing continues to make inroads into organizations of all sizes. Ensuring data is secure and accessible has become one of the most important issues facing IT professionals. As a channel partner, you need to be assured of the safety of your clients’ data – safe both from intrusion and loss. As more organizations move to the cloud, it has become increasingly crucial that businesses find a data center, like the NAP of the Americas that has been certified as a trusted provider of secure storage to provide peace of mind. Awesome Cloud has designated Verizon Terrekmark’s NAP of the Americas data center as its primary data center due to its certification as a Tier-IV data center that serves government agencies as well as private organizations of all sizes and types, including educational institutions, internet-based businesses, and even internet service providers. The NAP of the Americas data center acts as a communications hub between North America, Latin America, Central America, and other areas. 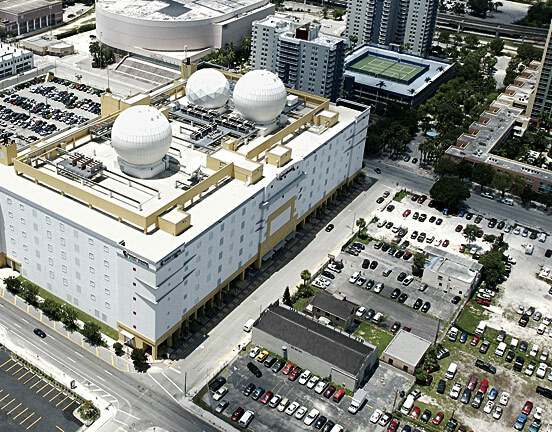 NAP of the Americas is a 750,000-square-foot data center located in Miami, Florida. Acting as a global telecommunications hub, it handles data and voice communications between locations worldwide. It is equipped with uninterruptible power sources to ensure that, even in case of natural disaster, your clients will always have access to their data. Because infrastructure redundancy is built into its design, construction can be conducted on any part of the facility without interrupting the operations of any of its servers. As one of the world’s most substantial telecommunications projects, the structure of our data center has been set up to protect against every possible risk. Flooding: The rooftop is designed as a slope that promotes the runoff of heavy rainwater beyond 500-year storm proportions. Eighteen rooftop drains aid in drainage so that equipment stays safe and dry. The data center is located well beyond the area designated as a 500-year flood zone by FEMA. Hurricanes: Buildings were constructed using 7 inch thick steel reinforced concrete exterior panels to protect against hurricanes and heavy storms. The roof itself features concrete ballasts weighing in at more than 19 million pounds. Fires: The NAP of the Americas is protected by a fire-suppression system that detects fire while holding water outside of the building. Only when a fire has been detected by the system is water released to ensure all equipment is kept safe from water leaks at all times. Military Grade Encryption: The biggest threat to data centers is to the data stored on its servers. The NAP utilizes military-grade data encryption to ensure top-level security on every server it houses. A Tier-IV data center, it is certified as a host of the most sensitive of data, which is why the NAP of the Americas is a trusted service provider to some of the top businesses and government agencies in the world. 24/7 Security: The data center’s command center has on-site armed security 24 hours a day. Security personnel monitor surveillance cameras on the grounds and safeguard access to the facility. Cardkey access is required for elevator use and for entry into all areas.. If you’re interested in learning more about Terremark’s NAP, reach out via email, by posting a comment below, or by checking out the NAP of the Americas website. Let’s keep the conversation going on Twitter using the @awecloud handle.